09.08.09 = When I look at this image, I think of a time gone by. A time when the motto was “Service with a Smile”. When it was called a “service station” and not just a “gas station”. What happened to “service”? 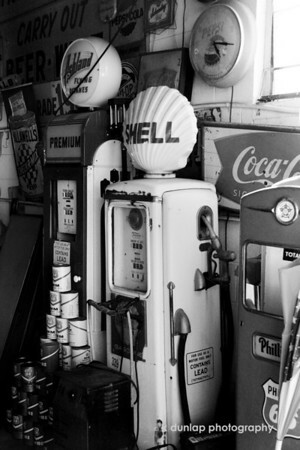 It’s not just at the pump but everywhere these days; from the gas station to the dry cleaners to most retail stores, where did the friendly service go? You can travel back in time with this image. Very nice. Fantastic B&W! Sure do agree with you about friendly service, I'm afraid it is long gone in most cases. Agreed K..... B&W suits this subject well. Wonderful feel to this. I agree with your comment, also. timeless...no more check your oil, wash window, pump your gas....the service is gone in big oil.